It’s been a long time coming. She’s needed these for several years, but it’s not been an option till now. 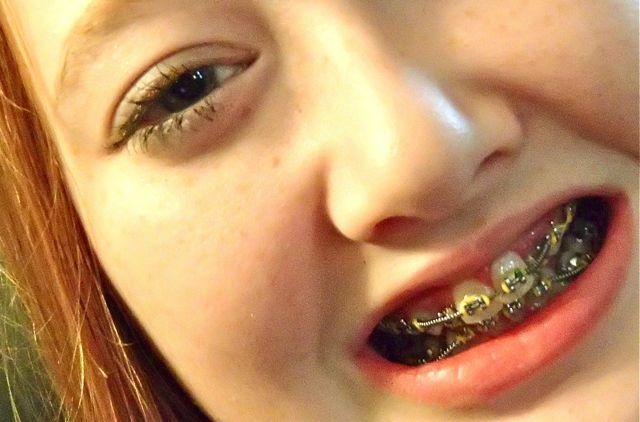 These are no ordinary set of braces… these are full of springs, thing me’s, and what-cha-majigs all going at once. Gone are the old grey boring bands and each appointment will bring wild new colored bands and crazy patterns to flash when she smiles. Amazing technology that replaces the old “head gear” is fully covered in the mouth and I’m astounded at how many things are working at once. And while it’s gonna be a hard job for her now that it’s here, it’s painful! Having a smile that has love woven into the very wires and bands that bind it together and will be a payoff worth far more than what we will ever spend for it in $$$’s. See, it’s not just a smile we are investing in here. It’s a heart. It’s a soul. It’s a future woman who will flash a grin without thinking twice about it, unhindered and fully lost in her moment of joy. That’s my hope. I remember being on her side of things. But I never faced the things she does. There is much about my beautiful redhead that I never share here… because she deserves respect and space… privacy and room to grow without a mom who tells all to whomever… But this I must say: She is amazing. She has things to deal with that sometimes take my breath away. She never asked to be dealt the cards she holds in her hand and must play in this game of life. But like all of us, she can either decide to play it out, or fold. In spite of the vast array of things she’s been up against lately, she has come to us each time when she could hardly stand up under the pressure and asked us for help. I don’t do “asking for help” at all well, and yet she has already learned the art of it with genuine courage and admirable poise. Her smile is somewhat of a side note in things… to some it may seem a vanity. Hers was a medical issue with jaw misalignments and headaches and pain. And still, it’s just one of the visible steps she’s taken that have been monumental in this, her first year of Teen-hood. My husband and I have chosen several new ways to help her play her hand. It’s altered our entire family’s life, structure, and routine. But that’s our job right? To help train up our children, to do what’s best for them, to teach them, to love them, to prepare them to fly someday when they must leave the nest… even if it rocks the boat a bit here and there. For years we’ve tried to do things the way everyone says they need to be done. But this month, we decided to say NO to what isn’t working and YES to ways we believe God needs us to do in order for her to fly instead of wobble. I KNOW our choices will bless her. She is already beginning to shuffle her hand of cards and arrange them so she is in charge of them vs them ruling her choices. She is rising up to the challenges and yet again I am amazed at the fact she is my own kid. I know this is vague. It’s intended to be so… but the message I want to shout is not. I am danged proud of my daughter, and I’m so blessed to be her mom. I am proud of the way she faced the trials of today with courage and determination, and yes, even with a smile. So well said! This brought tears to my eyes. I know it is a hard time but I admire how you are looking at the bright side of things and making the most of it. Praise God! Thanks Shane, so much. I’ve said thanks to God for YOU several times over this week. You have no idea. None. You’ve been used in a mighty way by Him.